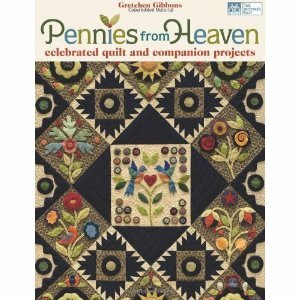 Until I have a chance to start working on the wall hanging, I have been reading the latest title I purchased for my quilt library: Pennies from Heaven: Celebrated Quilt and Companion Projects, by Gretchen Gibbons. The cover quilt is so beautiful! Gretchen begins her book with great tips for working with wool, including how to prepare wool if you prefer to felt it yourself, the many ways to prepare and applique the pattern, alternatives for affixing applique pieces to background, etc. Whether experienced or novice, you will enjoy Gretchen's book! As I was shopping yesterday with my friend Diana G., I was drawn to wool packets, patterns, scraps, kits... I did purchase background fabric for some projects I have in mind... but resisted buying wool, as I want to check out Primitive Gatherings offerings, which I heard are excellent. Have you worked with wool? Do you prefer to purchase it at local shops or somewhere on Cyber space?